Halibut stands up well to bold flavours. Cooked on the BBQ this recipe is perfect for the patio and dining al fresco. 1. Slice the halibut into 1” thick strips and place in a shallow glass dish. 3. Rinse the basmati rice and drain well. Into a pot over medium high heat, add the rice, remainder of coconut milk and 2 tablespoons water and a pinch of salt. Bring to a simmer, stir once, cover and turn heat to low. Cook for 18 minutes. Turn off the heat and allow rice to rest for 10 minutes. 4. Preheat your BBQ or outdoor grill. Brush grill with a neutral vegetable oil. 5. 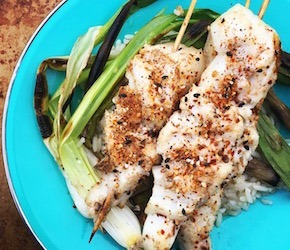 Place green onions and halibut on the grill. Cook for about 3-4 minutes, until the halibut releases easily from the grill. Flip both the halibut and green onions once and cook for another 2 minutes. 6. Remove and serve with the rice and a wedge of lime.